Où est le compte? Récemment, nous nous demandons plus souvent cettequestion. Encombré avec des magazines et des journaux, à larecherche des meilleurs prix, les offres et les promotions. Ehbien, maintenant vous pouvez tout avoir dans ma poche par"Catalogues Promo" et notre Android préféré :). Boutique informé!Gardez dans votre poche tous les catalogues actuels, des brochures,des promotions, des offres promotionnelles, des remises, rabais,des tarifs spéciaux et des concours, des jeux et la vente demagasins et supermarchés.Where is the account?Recently, we oftenask this question.Cluttered with magazines and newspapers, lookingfor the best prices, offers and promotions.Well, now you can haveit all in my pocket by "Catalogues Promo" and our favorite :)Android.Boutique informed!Keep in your pocket all current catalogs,brochures, promotions, promotional offers, discounts, rebates,special rates and competitions, games and selling shops andsupermarkets. Nerede hesab var ?Son zamanlarda daha sık sorusunu soran oldum.Eniyi fiyatlarla, kampanyalarını ve promosyonlarını arıyor, dergi vegazete ile darmadağın sanız . Her markanın kataloğunu veyabroşürünü görebilir ve indirimlerden haberdar olabilirsiniz.Teknoloji marketlerini takip edin, isterseniz süpermarketleri veyailgilendiğiniz başka bir alandaki mağazaları takip edin. 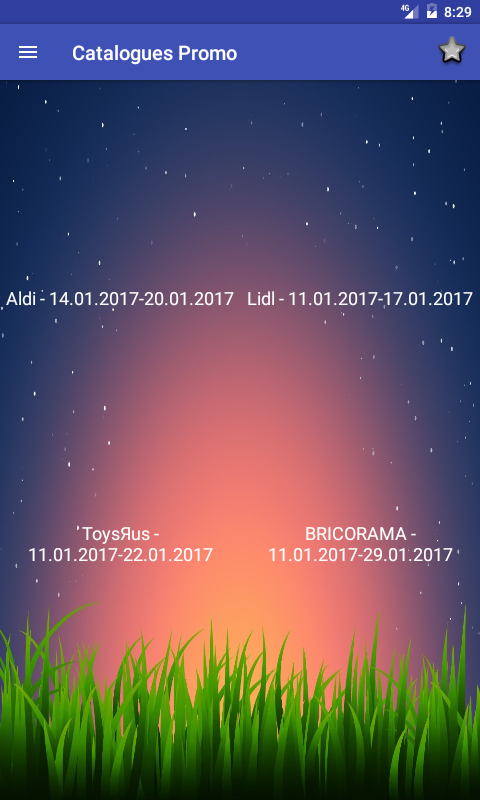 Peki şimdi"KATALOG-BROŞÜR VE İNDİRİMLER" ve bizim favori androidiyle :) ilecebimde her şeye sahip olabilir , özel indirim indirimleri güncelolarak takip ediyorsunuz.Dükkanlardan haberdar olun !Cebinizde enson katalog, broşür, promosyon, promosyon teklifi, indirim,İNDİRİMLER, ÖZEL FİYATLARI, yarışmalar, oyunlar ve satış mağazalarıve süpermarketler tutun .Where have account?Lately I've been askingthe question more often.At the best prices, offers and promotionsare searching for, you sayin cluttered with magazines andnewspapers. Each brand's catalog or brochure, you can see and youcan be notified of discounts. Follow the technology market, ifyou're interested in the supermarket or in another area storesfollow. So now "-BROCHURE CATALOGUE AND DISCOUNTS" and our favoritewith android :) might have everything in my pocket with a specialdiscount deals currently are watching.Be aware of shops!Save thelatest catalogs, brochures, promotional, promotional offers,discounts, DISCOUNTS, SPECIAL PRICES, contests, games and holdretail shops and supermarkets. Къде е на сметка ?Напоследък си задаваме все по-често този въпрос.Затрупваме се със списания и вестници , търсейки най-добрите цени, оферти и промоции.Е, вече може да имаме ВСИЧКО това в джоба сипосредством "ПРОМО КАТАЛОЗИ" и любимото ни андроидче :).Пазарувайте информирани! Дръжте в джоба си всички АКТУАЛНИКАТАЛОЗИ , БРОШУРИ ,ПРОМОЦИИ, ПРОМО ОФЕРТИ, НАМАЛЕНИЯ, ОТСТЪПКИ,СПЕЦИАЛНИ ЦЕНИ, КОНКУРСИ, ИГРИ И РАЗПРОДАЖБИ НА МАГАЗИНИТЕ ИХИПЕРМАРКЕТИТЕ.Where is the account?Recently, we ask ourselves moreoften this question.Cluttered with magazines and newspapers,looking for the best prices, offers and promotions.Well, now youcan have it all in my pocket through "Changes CATALOGS" and ourfavorite androidche :).Shop informed!Keep in your pocket allcurrent catalogs, brochures, promotions, promo offers, discounts,DISCOUNTS, SPECIAL PRICES, contests, games and selling shops andsupermarkets. Más de 200 cuentos de audio para los niños.¿Está cansado de ponerlos niños a dormir?No quieres tiempo para ti?Estamos orgullosos depresentar la solución a su problema:Cuentos para los niños y la pazde la mente.Proporcionar tranquilidad agradable para su hijo-Escuchar la historia favorita de un smartphone con Android y paraconocer a su hijo con el mundo de cuento de hadas clásico.Si ustedestá en el país, las montañas, el campo, la playa, los huéspedesalojados en el extranjero - más de 200 historias han estado entodas partes con usted - con su teléfono inteligente Android y unaconexión a Internet.Over 200 audio stories for children.Are youtired of putting the kids to sleep?No time like for you?We areproud to present the solution to your problem:Tales for childrenand peace of mind.Provide pleasant tranquility for your child -Playthe favorite story of a smartphone with Android and to know yourchild to the world of classic fairy tale.If you are in the country,the mountains, the countryside, the beach, guests staying abroad -more than 200 stories have been everywhere with you - with yourAndroid smart phone and an Internet connection. Više od 150 priče za laku noć za slušanje.Jeste li umorni dauspavati djecu?Zar ne želiš vremena za sebe?Ponosni smo predstavitirješenje za vaš problem:Priče za djecu i svoj ​​mir.Obezbijeditimir ugodne za vaše dijete -Play omiljenih priča o smartphone saAndroid i zadovoljiti vaše dijete sa svjetskim klasičnimpričama.Bilo da ste kod kuće, planine, krajolik, plaže, gosti uinozemstvu - više od 150 priča su bili svuda sa sobom - sa svojimAndroid smartphone i Internet veze.More than 150 bedtime stories tolisten to.Are you tired of having the children sleep?Do not youwant time to yourself?We are proud to present a solution to yourproblem:Stories for children and peace.Provide peace enjoyable foryour child -Play your favorite story about a smartphone withAndroid and satisfy your child to the world of the classictale.Whether you're at home, mountains, scenery, beaches, guestsabroad - more than 150 stories have been everywhere with you - withyour Android smartphone and Internet connection. Più di 300 storie della buona notte per l'ascolto.Sei stanco dimettere a dormire i bambini? ?Non vuole tempo per te stesso? ?Siamoorgogliosi di presentare la soluzione al vostro problema:Storie peri vostri figli e la vostra pace della mente.Fornire la pace dellamente piacevole per il vostro bambino -Gioca storia preferita diuno smartphone con Android e incontrare il vostro bambino con lestorie classiche del mondo.Sia che siate a casa, le montagne, lacampagna, la spiaggia, gli ospiti all'estero - più di 300 storiesono state ovunque con te - con il vostro smartphone Android e unaconnessione a Internet.More than 300 bedtime stories forlistening.Are you tired of putting babies to sleep?Do not take timefor yourself?We are proud to present the solution to yourproblem:Stories for your children and your peace of mind.Providepeace of mind enjoyable for your child -Play favorite story of asmartphone with Android and meet your child with the classicstories of the world.Whether you're at home, the mountains, thecountryside, the beach, guests abroad - more than 300 stories havebeen everywhere with you - with your Android smartphone and anInternet connection. AppSales offers an easy, convenient way to discover and downloadthe best apps and games on sale and keep an eye out for apps gonefree deals. Our manual review process ensures that only the hottestsales are published and a price history provides transparency andgives you the right information to make a purchase, with theability to compare prices over time before making a purchase. ✔*NEW* Discover paid apps that are free for a limited time Googlerecently made it possible for developers to make their paid appsavailable for free for a short time which wasn’t possible before.Our new “Now Free” tab highlights those deals so you can grab theapps while the offer lasts. ✔ Search for your favorite apps withour new SEARCH function! Add apps, games, and wallpapers to yourpersonal Watchlist (watcher feature). Monitor prices and receivenotifications or alerts when new apps go on sale or are heavilydiscounted. Save money and download the top apps for Android withAppSales! ✔ App price monitoring has never been this easy! Features• Modern, intuitive user interface (Material Design) • Keep an eyeon the store at all times with our price tracker, allowing you toreceive notifications and alerts when the app you want gets adiscount • Get notified about the new best sales on the Google PlayStore and apps gone free • Weekly app-deals (if available in yourlocation) • Exclusive offers, voucher codes and launch sales • Onlythe top hottest apps, games, and wallpapers free deals and offers •A price history provides transparency, allowing you to compareprices over time as well. • Discover other versions of a discountedapp (e.g. free, lite, HD) • Search for your new favorite apps andadd them to your Watchlist • Get notified when app prices drop onthe Android market • Use filter and categories to personalize yourexperience • Sync your Watchlist across your Android devices •Share sales with your family and friends ✔ Your Personal Watchlist:Use our newest search function or add apps directly from the PlayStore to your Watchlist to monitor prices and get notified aboutprice drops, discounts and when apps change from paid to free. ✔Price History: A Price History lets you easily view the min, themax, and the average price during the last 60 days (360 if you area Premium user). Validate sales and detect price-patterns to savemoney by purchasing an app at the best time, usually during a pricedrop on the Google Play store. ✔ Watchlist Charts: Grouped into 3sections (Last 24 hours, last 7 days, and all time) you can easilydiscover brand new trending apps or the overall best paid apps. ✔Latest Discounts: Our manual review process ensures a high qualitysales list, but it also means that sales are not publishedinstantly. The ‘Latest Discounts’ section displays an unfilteredlist of the most recent discounts. ✔ Filter: Use filters topersonalize the list of sales by defining your minimum discount anddownload threshold. You can also choose to hide expired apps fromyour sale list. ✔ Categories: Not interested in apps of certaincategories (e.g. Games or Wallpapers)? No problem, you can disablenotifications for specific categories or completely hide them fromyour sale list. Special categories for NVIDIA SHIELD or root appsare also available. Why Should I Download AppSales Best Apps OnSale? (tl;dr) AppSales lets you discover the best apps and games onsale thanks to smart features and a manual review process. Otherfunctions, like a price monitor or Watchlist Charts, makes AppSalesan all-in-one solution for apps gone free deals and offers.Suggestions? Feedback? Leave us a comment or rating in the GooglePlay Store or contact us at: [email protected] Please note: Actualprices may vary depending on your location and currency. Promotional items are one way of saving money, translating intoearning money in the long term. Stay up to date with sales, promosand discounts in your city, as well as in many online stores.Comprehensive search will help you find what you need at the lowestprice! Buy profitably. This is our motto! Features of our app: -50,000+ promo items, sale and discounts; - 100,000+ items in onlinestores; - Popular promotions in your country; - Popular storesections; - Easy to find deals, promotions and sales; - Price rangesearch feature; - Favorite section for your desired promotions. -Sort by: name, price or NEW deals; - Map. Easy to find storelocations - News feed. Push notifications with store update details- Save Your money easily! And many other features. Is your favoritestore missing? Just write to us! And we will add it ASAP! "Discounts" Save on your purchase, then earn! Sales, discounts andpromotions! Slickdeals is the largest deal-sharing community on the Web withmillions of people regularly using the Slickdeals app to discover,share, rate and shop the best deals and coupons for their favoritestores. We know when Kohl's has 30% off, if Walmart is pricematching Amazon, and when Groupon has your favorite restaurantdeal. If there’s a deal, coupon, rebate, promo or freebie outthere, we have it on the Frontpage. There are people in this worldwho pay full price and there are people who don’t. After youdownload this app, you'll never pay full price again. How it works:Our community members find deals around the Web and share it on ourforums. Every deal gets vetted by the community through votes andcomments, and the good ones move up to the Popular Deals forum. Ifyou want to beat the rush and increase your odds of snagging agreat deal before it reaches the masses, the Popular Deals forum isthe place to be. The best Popular Deals are screened by our DealEditors after getting enough votes to be considered for theFrontpage. If the deal is as good as it seems, it will graduate tothe Frontpage, which features the best of the best on any givenday. If you prefer a more hands-off approach to finding greatdeals, set a Deal Alert and get notified whenever a deal matchingwhat you're looking for is posted on Slickdeals. You can configureyour alert for keywords, stores and categories. You decide how andwhen you want to get notified, but remember, the best deals usuallydon't last long. If you've already filled up your online shoppingcart and want to see if there's a last chance to save some money,check out our coupons pages. We have coupons for every store thatoffers them and our in-house team of coupon editors are quick toremove expired promo codes so you don't waste your time. If youlike browsing deals by category, this is the app for you. If youwant to look at only video game deals or see what household itemsthat are on sale, for example, check out our category pages! Havean issue with the app? Suggestions? Praises? Coupons? Send us anemail [email protected] - Your feedback will help usmake this the best deals app. Slickdeals may share data or thirdparties may collect data for interest-based advertising. For moreinfo, see the “Interest-Based Advertising” section of our privacypolicy. Home Deals are easy to find, where our editors do the research foryou. We only post the best deals, so you always get the lowestprice. Home deals & offers for 2018 ✅ Find today's bestdiscounts & sales ✅ Get the cheapest price for Home and savemoney ✅ Deal alerts to be notified about new deals and vouchercodes ✅ Your Shopping Community Looking for Home deals? Check outthe latest sales & special offers. Download Home Deals. Startsaving money today!